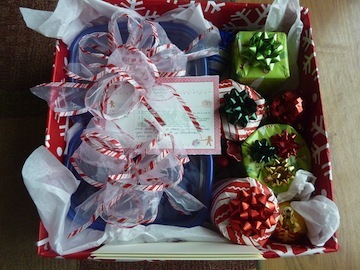 I am always looking for clever personal gifts and this is such a cute idea! It’s a given with the holidays: you have friends or family with kids who are too old for toys. Gift cards seem to be a logical choice for teens and even tweens; after all, they can enjoy the freedom to shop for what they want and make their own choices. But a small envelope can look a little thin, like an afterthought present at best. Consider, then, a themed package for the whole family. Bookstore gift cards for each of the kids in a separate envelopes (you can see the envelopes tucked along one of the sides of the box in the picture above). Container of baked, cut-out sugar cookies (undecorated), with big white filmy bow atop.